Whether your dog needs heavy protection for the rugged outdoors or some stability for slippery floors, we’ve got just the style of footwear to suit any canine (and owner) personality. PAWks line of dog socks from RC Pet Products. Rugged outdoor paw protection from Ruffwear. Natural rubber dog boots by Pawz. Canine footwear is also the best way to keep your house clean from the outdoors. We take our boots and shoes off at the door and your dog can too (with a little help of course). As fashion meets practicality and protection goes paw-in-paw with accessorizing, our paw-wear has been purchased for a variety of reasons. Protecting dogs from outdoor elements, including salt and snow in the winter, harmful lawn treatments, excessively hot sand or asphalt and bacteria are just a few of the reasons dog footwear is important. There is also the unfortunate occurrence of dogs’ claws damaging flooring, furniture or other surfaces, so we’ve got a durable line of inexpensive options to help your friend reduce his or her impact on the house. Seasonal changes call for appropriate gear to make the best of all the activities you enjoy with your dog. 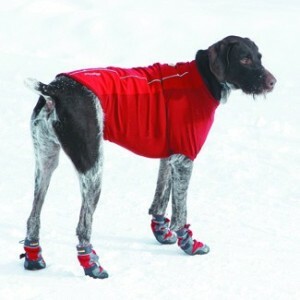 Comfort, safety and fashion can be all accomplished for your pet with footwear that fits the weather and the paw. Whether it’s getting added warmth during the cold icy months, or keeping cool from the hot summer pavement, you’ll find a perfect fit for any situation and get to show personality that shines with every step. Call us today or come in to see our full collection of quality products for your favourite paws – simple anti-slip socks to the ultimate snow trekker, and all the options in between.